I have recently found myself in the wintery North again, and I have rediscovered my love of knitting. Sure, I enjoyed knitting cotton washcloths in Florida (who doesn't enjoy a good washcloth? ); however, since I have been back in colder weather, the yarn has been calling to me full force. I am being commanded to knit wool hats and wool socks and wool mittens and wool...well you get the idea. Since being here in Pennsylvania (I wasn't kidding when I said the wintery North), I have joined a little knitting group in town. I am excited about spending time with other knitters. Most of the knitters I knew in Florida, I had taught. I love spending time with new knitters; however, whenever I spent time knitting with them, I showing them how to do stuff. 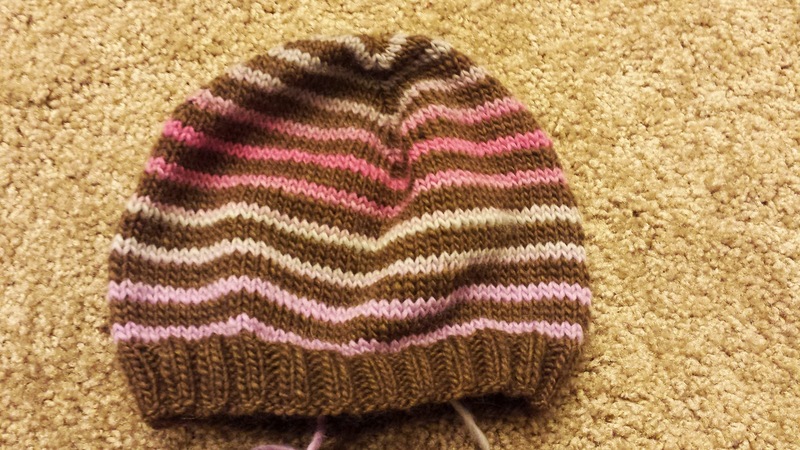 I like being able to knit during my knitting meet ups. I do like teaching others to knit too; I just don't like it to be the only thing I do during knitting time. My ravelry page is a bit out of date, but I am hoping to get it updated with my projects in the next few weeks. I mainly have to take pictures of things. I also plan to have my entire knitting book and magazine collection in my ravelry library. It is a pain to do, but I think it will help when I am searching for patterns. This brings me to the next part of the plan. I have five huge bins of yarn in my one-bedroom apartment. If I was living alone, this wouldn't be a big deal, but I have gotten married, since I last posted. My husband is totally okay with the stash, but I would like us to have a bit more room in the closet. I also don't feel like I can cram any more yarn in the closet, so I don't feel okay with buying more yarn when it won't have a cozy home. Okay, back to the plan. My plan is to knit down one bin of yarn a year. I have two bins of sock yarn, one bin of worsted weight yarn, one bin of sport and dk yarn, and one bin of bulky and lace weight yarn. This isn't the best plan ever, but I am going to go with it for now, because I have momentum. 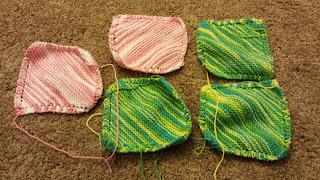 I am working on the worsted weight stash right now. I have completed several washcloths (I have cotton yarn that needs to be washcloths) and a Turn a Square hat. I have big plans for more Turn a Square hats to deal with some of the self-stripping yarn that I have. We get free expanded basic cable at our new apartment, so I have been watching a ton of HGTV and SyFy. It works out great, because they are next to each other. I just press the up or down button, and I am good to go. The HGTV shows are all the same, which I find strangely comforting. It is nice to see people find their "dream home." As far as knitting TV goes, HGTV is great, because I don't need to look up too much to know what is going on. In regards to SyFy, there are a couple of shows that I am enjoying. First, I enjoy FaceOff. It is a reality competition show about people who do costume makeup. The makeup designs are pretty awesome, plus the people seem relatively nice and the show doesn't focus on drama outside of the competition. Second, Heroes of Cosplay is pretty fun. This show focuses on people who do cosplay semi-professionally/professionally. The folks are a bit catty at times, and there is a bit of snobbery towards the casual cosplayer. Finally, I am obsessed with the Thursday night movie. Sharknado was pretty amazing a few weeks ago, and Ghost Shark was pretty decent too. These movies are supposed to be a bit gory, but their budgets are so bad that nothing on them grosses me out. They are just campy and ridiculous.